I love to ride my bicycle. And boy was I happy to know that Marc was in the business of fixing bikes. After years of fly-by-nighters and fakes, finally a mechanic to entrust with my faithful steed. It took a few days of “Liquid Wrench” soaking into the crevices and it took quite a bit of force to muscle that crank out but he did it! And me and my bike ride again. In 1985 Marc came west to do a bike tour with a friend—they did a one month tour of Vancouver Island, including Tofino and the Sunshine Coast. He was planning to return to Quebec at the end of the tour but decided to stay. He worked at Denman Cycles as a bike mechanic and then he got his certification from the Canadian Cycling Association. Marc then went to Capilano College for a two year Outdoor Recreation Management program. As part of the course, students were required to do a practicum and Marc did his with the Western Canada Wilderness Committee (wc2) and it was through them that Marc came to Tofino. The oil spill in the winter of 1989/90 brought lots of people to the area to help with the clean-up and Marc was one of those. He was sent by wc2 to spend a month here to gather information, take photos, and help with the clean-up. He came back in the spring for a kayak guiding job and has been here ever since. Years of full on kayaking, came to a rather abrupt end when Marc hurt his back so badly he wasn't able to work for a month. That was a month without income, (this was not a union job) he was forced to come up with another plan, a “safety net,” something that he could combine with his love of kayaking and not be as strenuous on his back. And Marc now divides his time between paddling—he continues to guide one Kayak trip a day—and doing bike repairs in his very compact and extremely well organized shop in the carport of his home. Bicycles lean against the posts or hang from hooks on the ceiling all securely locked. The closet office/storeroom has a mobile work bench that rolls right out of the office to the “workshop.” The bench is well-stocked with grease, oil, and wd-40, all essential to the well being of a westcoast bicycle. Bike parts of all sorts and sizes, along with accessories, line the walls and fill the drawers of this immaculate office—every space ingeniously used, and the drawers are all neatly labeled. This man is detail oriented! On the door of the office is a small bicycle that is made in Indonesia, it hangs above his business license, postcards, and pictures mostly featuring bikes. One in particular is of a man in a bike repair shop in Indonesia, it is a friend, and is a clue to the connection Marc has with that country. It was in Indonesia that Marc found another lasting love—and a big support in his life and business—his wife Adi. She is an amazing cook and is good with a wrench too. Adi helps to assemble the new bikes that come into the shop—and into the house. The bicycles have entered their living space. Boxes line the walls, bicycles in various states of being lean against cupboards—every room has signs of this very literal “home” business. 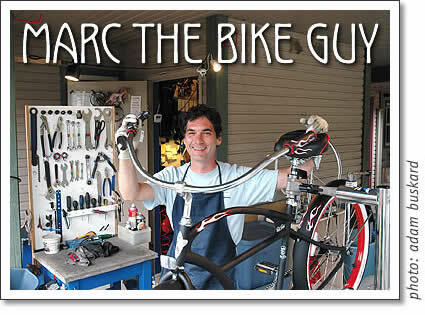 Marc not only repairs bikes, he sells new ones too. He is the only authorized dealer in Tofino for the Electra Beach Cruiser—that funky bike that so many ride the beach with. You can see them, and rent them at Fiber Options. Marc assembles the bikes for Fiber Options and is the in-house mechanic there, so you know those bicycles ride well. And if you have a bike that works but you want to funk it up a little bit—call Marc—he does custom conversion. You can have those ape hanger handlebars and other cool little things like skull valve caps and streamers. There are beautiful baskets, bike seats, bottles and the basics, like helmets. He’s got most everything, and if not he’ll order it. Multitalented and creative, Jan Brubacher writes films, creates jewelry and costumes, and convincingly plays the role of mother. Tofino business profile of Marc the Bicycle Guy by Jan Brubacher for Tofino Time magazine.